Herby Hemp Sauce | Cooking Component | Naturally.Herby Hemp Sauce | Cooking Component | Naturally. 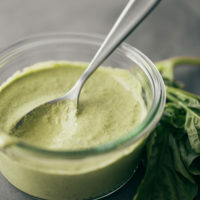 To make dressing, combine all the ingredients in a blender and puree until smooth. If using a regular blender or food processor, soak the hemp seeds for an hour or so before making the dressing. Taste and adjust salt as needed. Tips & Tricks: This dressing will keep in the refrigerator for a few days. Use it for other salads or as a sauce for grain bowls and/or roasted vegetables.